First Concept Art From The Third Riddick Movie: Left For Dead On A Monster Planet! 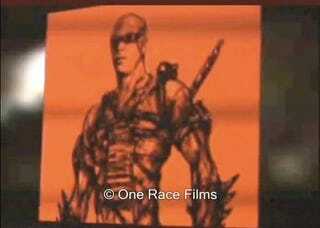 Vin Diesel decided to release this video of the film's Riddick concept art presentation, and we're glad he did - because the new details have us absolutely spinning, like the new jet cycles the futuristic mercs will be hunting Riddick down on. In the upcoming third installment of the popular sci-fi franchise, Riddick get's betrayed by the Necromonger army and is left for dead on a desolate planet. He has to fight for survival against alien predators and must deal with two squads of bounty hunters, who are coming after him to collect the bounty for the most wanted man in the galaxy. But that wasn't all we learned. In the videom writer and director David Twohy explains that in "this next installment of the movie, we hope to go back to a more visceral kind of filmmaking, back to a single containing world, back to an R-rating." Which means more alien animals for Riddick to fight, train and hopefully ride. Check out our gallery of screen grabs of awesome concept art from the video.